It’s no secret that PhD students and postdocs are paid a meager salary, sometimes not even as much as the local living wage. While a fraction of graduate students have probably always pursued side income to supplement their stipends/salaries, e.g., through part-time jobs, moonlighting, or odd jobs, only in recent years has it become easy to make money online or make money from home. Enter the ‘side hustle.’ The term exploded in popularity during the Great Recession along with the ‘gig economy.’ The flexibility of modern side hustles has made it possible for students and postdocs to fit their income-generating activities around their busy research schedules. This article details why a graduate student or postdoc would want to side hustle, whether it’s allowed by their university/institution, examples of real side hustles held by PhDs, how to best manage the side income, and advice from PhDs with successful side hustles. The motivations for having a side hustle during your PhD training are to make up for the deficiencies in what the university provides: money (primarily) and career-advancing experiences. Pursuing your PhD during graduate school or gaining additional training as a postdoc is supposed to be your full-time (or more) pursuit. Research is life, right? Unfortunately, the positions don’t pay anywhere near as well as a regular full-time job. The best case scenario for a PhD student or postdoc is that you will be paid enough to support yourself without making extreme lifestyle sacrifices, i.e., living in a van. However, there are plenty of programs and universities that do not even meet that low bar for a single person with no dependents. For a graduate student or postdoc with a dependent spouse (e.g., of an international trainee) or children, the low stipend or salary is almost certainly inadequate. Graduate students almost always turn first to cutting their living expenses to be able to live within their means. They know that they are supposed to devote the lion’s share of their weekly energy to their coursework, research, and teaching. But when their backs are against the wall, some make money on the side to avoid going (further) into debt. Some graduate students and postdocs are motivated to side hustle not by lack of income but rather lack of practical career preparation. What careers does a PhD or postdoc prepare you for? These days, the vast majority of PhDs are not hired into tenure-track faculty positions. (Time to stop calling the jobs most PhDs get “alternative”, right?) Some universities have acknowledged this and put in place programming to help PhDs transition out of academia (my alma mater, Duke University, and in particular the Pratt School of Engineering, is innovating in this area), while others are still catching up. Of course, PhDs have plenty of transferable skills that can be put to use in a wide variety of careers, but landing a job is still challenging. A judiciously chosen side hustle (or even volunteer work) can help a PhD build out her resumé/CV and network to stand out from the other PhD applicants. A side hustle can teach you new skills, give you an opportunity to demonstrate the skills you already possess, and introduce you to professionals who can further your career journey. Are Side Hustles Allowed by Your PhD Program or Postdoc Position? While some academics may take the view that side hustling distracts from classes, teaching, research, etc., for some people a side hustle is the main factor that enables them to stay in their graduate programs or postdoc positions. They side hustle because they want to keep doing PhD-level research; otherwise, they can just leave and earn more money elsewhere! If conceived and managed properly, a side hustle is not a distraction from the student or postdoc’s training but rather an enhancement of it. 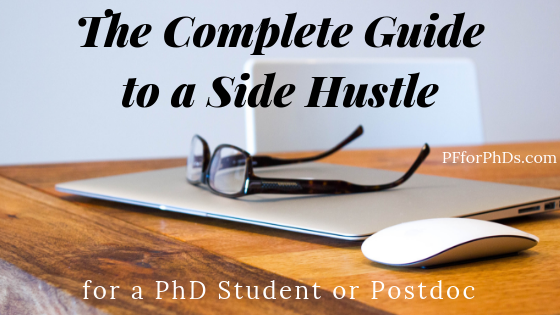 If you think about graduate school or your postdoc as similar to any other type of job, usually the only stipulations regarding your side hustle are that: 1) it does not interfere with your primary job and 2) it does not present a conflict of interest. That logic is helpful for thinking through whether a side hustle is allowed, but the universities sometimes add layers of complexity. Further reading: Can a Graduate Student Have a Side Hustle? Side Hustle Permissibility by Position Type: International, Fellow, Employee, Etc. There may be explicit bans on making money on the side or it may be frowned upon. The income and experience gained from a side hustle is not worth getting kicked out of your graduate program or postdoc position. The F-1 and J-1 visas generally only permit employment directly in your capacity as a graduate student or postdoc. Sometimes, you can seek permission for other employment ventures, such as Optional Practical Training (OPT) for F-1 visa holders. A side hustle that you work on simultaneously with your research will likely not comply with these rules, so it’s a no-go. Check the terms of your fellowship funding supplied by your university, employer, or funding agency. There may be a stipulation that no outside income is allowed as the fellowship is designed to support you completely and require your complete dedication. If you choose to pursue a side income against the terms of your fellowship, proceed with extreme caution and recognize the downside is potentially losing your primary funding. In other cases, outside income is not mentioned by the fellowship terms or is even explicitly allowed. This is the category of graduate students most likely to be able to get away with a side hustle or be explicitly allowed because your responsibilities are generally time-limited to 20 hours per week (officially). Of course, beyond that, you are responsible for your dissertation work, so side hustling might conflict with that important pursuit. If you are in a contract with your university, check its terms. If outside income is not allowed, proceed with caution as you might lose your assistantship. You might, however, find a provision that allows outside income, perhaps up to a certain number of hours per week. A postdoc employee has a regular job, albeit a demanding one. Your desire to side hustle at that point in your training is more likely motivated by career advancement rather than income. Again, check your contract, but a side hustle may very well be permissible as long as it doesn’t interfere with your work. If you are working in your field, though, it could be a good idea to seek your advisor’s permission in advance. What Does Your Advisor Think? The person with the most important opinion on your side hustle–after you–is your advisor. Allowed, disallowed, frowned upon… The status of side hustling in the eyes of your university, department, or funding agency is less important than its status to your advisor. If your advisor is an unforgiving taskmaster who expects his myopic view of the supremacy of research to be adopted by his trainees, a side hustle is a very risky endeavor. However, if your advisor is a reasonable and kind person who respects work-life balance, it may be better to ask for forgiveness rather than permission if your side hustle is discovered and viewed negatively. Prohibitions against outside income make sense when the income comes from a part-time job with fixed hours (meaning that you wouldn’t be able to stay late in lab if necessary) or if it takes so much time overall that you can’t complete your work healthily. But I don’t find prohibitions against outside work that doesn’t interfere with the student or postdoc’s primary ‘job’ any more logical than prohibitions against having a family or a hobby (assuming no conflict of interest). Ultimately, rules or no rules and advisor’s opinion aside, you are the only person who gets to decide whether to pursue a side hustle. You are the one who will manage it and make sure that it enhances your PhD training instead of detracting from it. I break side hustles for PhDs into four categories: ones that advance your career, ones that you enjoy, ones that pay well (enough), and passive income. A side hustle that pays well and advances your career is ideal. If you can’t achieve that, doing something you enjoy is obviously preferable to doing something that you dislike or feel neutral toward that simply pays some bills. Passive income is outside of this ranked order as it doesn’t involve trading time directly for money. By the way, if you are looking for a way to increase your income that your advisor would be totally on board with, try applying for a fellowship. I’ve created a guide to applying for and winning fellowships that includes a list of broad, portable fellowships that pay full stipends/salaries. There’s no better type of side hustle than one that pays you and helps you along in your career. Through this type of side hustle, you put your current skills to use, learn new skills, expand your network, and/or explore a possible career path. Often, this sort of side hustle is related to your current field of research or uses skills you’ve honed during your PhD. You might even be able to start working for a potential future employer while you’re still in training. Sometimes an enjoyable hobby can be monetized or you can find meaning and delight in a side hustle. This kind of side hustle is one you would likely spend some time doing even if you weren’t being paid and can be particularly revitalizing during the long slog of your PhD or postdoc. If the only purpose a side hustle fulfills is bringing in some money, it’s done its job. Sometimes these pursuits are necessary for survival, but you shouldn’t spend any more time on them than absolutely necessary. Passive income has become a bit of a buzzword in recent years. Ostensibly, passive income occurs after you make some kind of investment that then pays a residual. Making a monetary investment in a rental property or dividend-paying stock is a classic example of passive income. The former is definitely a possible income source for a PhD who owns her own home. If you don’t have money up front, you can “invest” your time and talent into a product that people will buy over time. The classic example of that type is an author who is paid a royalty with each book sale. The current fad incarnation of passive investing is a promise that you can “make money while you sleep!” through online business, generally selling previously created digital products. (I do this in my business.) However, almost no online business runs for long without input of time and labor. The upside for a graduate student or postdoc, however, is that the large time investment needed up front to generate passive income and the maintenance over the long term can generally be performed on your own schedule and under the radar. Set weekly limits for yourself on the amount of time you will spend on your role as a graduate student or postdoc vs. on your side hustle. If your time spent side hustling creeps too high or your time spent on research dips too low, you know you need to readjust. Expect your weekly time goals to change throughout the seasons of your PhD training. It’s best if you conduct your side hustle in a different location than your primary PhD workspace; for example, you could work from home on your side hustle and never in your office or on campus. An alternative to geographic boundaries is temporal boundaries, such as never working on your side hustle during daytime working hours. The exact boundaries you set will depend heavily on the nature of both your PhD work and your side hustle. An ideal side hustle for a PhD is one that can be accomplished from anywhere at any time and ramped up or down depending on how busy you are with your research. This is not realistic for all side hustles, but the more axes of flexibility yours has the better it will complement your primary job. An internship or professional fellowship that requires time away from your graduate program or postdoc obviously can’t be kept secret, but many other side hustles can fly under the radar of your advisor and department if you want them to. The seriousness of the possible repercussions or how “frowned upon” side hustling is should dictate how open you are about your pursuit. Keep in mind that a side hustle in your current field of research may very well get back to your advisor as communities are quite small, so in that case it may be better to be completely above board. Most side hustles are independent contractor or self-employment positions, which means that you become an entrepreneur (or solopreneur) of a kind. There are some common best practices in self-employment you should put in place from the start of your side hustle. Separating your personal transactions from your business transactions at the account level will help you keep track of exactly how much money you are earning after expenses and what is deductible on your tax return. You can make periodic transfers from your business account to your personal account to pay yourself. Your PhD side hustle generates (potentially) taxable income, subject not only to income tax but also in many cases self-employment tax. Add your marginal tax brackets at the federal, state, and local levels together with the FICA tax you must pay, and set aside that fraction of each of your side hustle paychecks to ultimately pay the extra tax. If you earn enough in your side hustle compared to your primary job, you eventually will need to start paying quarterly estimated tax. Fellowship recipients who don’t have automatic tax withholding are already familiar with this process. Even if you aren’t required to pay quarterly, expect a larger year-end tax bill. The best way to ensure you don’t blow your side income is to assign it a job to be completed as soon as it hits your personal account. You could pay a specific bill or two with your side income or only allow yourself certain indulgences from your side income. For example, Jenni saved her side hustle earnings for travel.